Chloe Parker has the world at her feet. Her career in magazine publishing is flourishing, and she’s about to marry the man of her dreams, billionaire philanthropist Miles Durant. But one month before her wedding, she receives a countdown card. No sender. No return address. No message. Only a piece of lace stained with blood. As the wedding gets closer, the cards keep coming, every day without fail. It seems, while she’s counting down to the happiest day of her life, someone is doing a countdown of their own. Chloe fears she’s in danger, but she can’t turn to the cops for help. 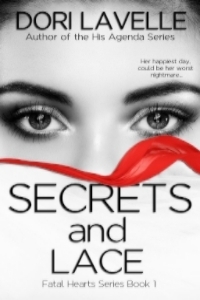 There’s something in her past she wants to remain hidden, a dark secret that could destroy the life of her dreams. To make things worse, Miles is becoming increasingly impatient and suspicious about her past, to the point where he’s so angry he becomes a man she doesn’t recognize.